RE/MAX Shoreline was founded in 2016 with a foundation of highly productive agents with roots from 1994. Shoreline agents continuously maintain the highest customer satisfaction reviews and consistently maintaining high market shares. RE/MAX currently holds the top market share for brand yearly on sales volume. The Portland office of RE/MAX Shoreline remains at the center of productivity. 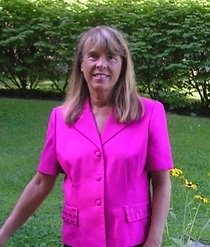 When you work with a Shoreline agent, you know you will have the best outcome! Team concept, Higher level of support produces a better outcome. RE/MAX Shoreline New Hampshire was founded in 2016 when Derrick Buckspan & Rachel Reed acquired the Portland, Maine & Portsmouth, New Hampshire RE/MAX franchises. Prior ownership lead the RE/MAX brand in the state and was integral in building the market share dominance of RE/MAX. RE/MAX Shoreline agents consistently out-produce and achieve higher overall customer satisfaction for both selling and buyers of Maine & New Hampshire real estate. While the numbers are impressive, they mean nothing until your sale or purchase is a part of this proud history! Check out this virtual tour of my office! “Outstanding Agents, Outstanding Results” is the motto of Re/Max and is the #1 franchise in the world. Whether locally, statewide, nationally or globally, put the power of Re/Max to work for you! 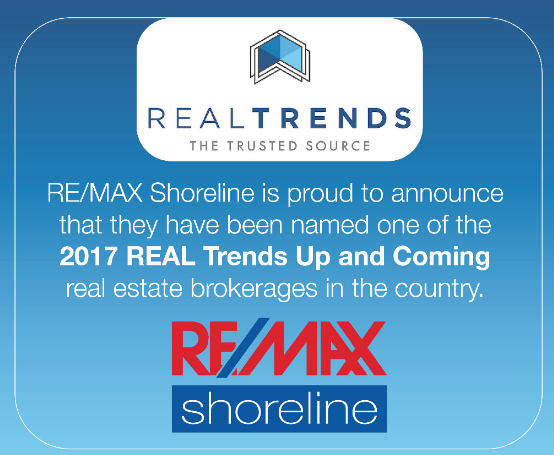 Portland, ME and Portsmouth, NH – RE/MAX Shoreline is proud to announce that they have been named one of the 2017 REAL Trends Up and Coming real estate brokerages in the country. RE/MAX, LLC, the #1 name in real estate, announced its agents outperformed agents with other real estate brands in the 2017 REAL Trends 500 survey. Associates affiliated with the RE/MAX network regularly average double the number of transaction sides per agent when compared with competitors in the annual survey of large brokerages. RE/MAX associates included in the survey on average outsold competing agents with a ratio of more than two to one. Agents affiliated with RE/MAX averaged 17.2 transaction sides while agents with competitors averaged 7.8. RE/MAX qualified more brokerages than any other real estate brand with 550 (32%). Keller Williams, the next closest competitor, qualified 395 brokerages (23 percent). Qualifying brokerages affiliated with the RE/MAX network claimed 88 of the top 100 brokerages when ranked by transaction sides per associate. When ranking all 1,705 qualifying brokerages by transaction sides per agent, the 88 RE/MAX brokerages in the top 100 averaged 30 sides per agent. RE/MAX agents included in the survey averaged $4.4 million in sales volume, 76 percent higher than the $2.5 million average of all other agents in the survey. Earlier this year, RE/MAX once again held the top position among real estate brands in the annual Franchise 500® survey by Entrepreneur magazine. The growth rate, financial stability, and size of the RE/MAX system also propelled the franchisor into the top 10 of all franchises included in the listing. This year’s ranking marked the 14th time in 18 years that RE/MAX has been listed as the top franchisor in the survey’s real estate category. RE/MAX was ranked the leading real estate franchise for the eighth consecutive year in the most recent Franchise Times Top 200+® list. Continued growth and a steady increase in the number of locations also pushed the global franchisor of real estate brokerages into the top 10 franchises included in the survey. RE/MAX ranked #8 overall, up from #11 in 2015, #12 in 2014 and #14 in 2013. The growth of RE/MAX sales countered the trend of the 10 largest franchised brands collectively losing system-wide sales for the first time in the history of the listing. With a presence in over 100 countries and territories, the RE/MAX network’s global footprint is unmatched by any other real estate brand. The franchisor’s total agent count grew 6.8 percent year-over-year in 2016. 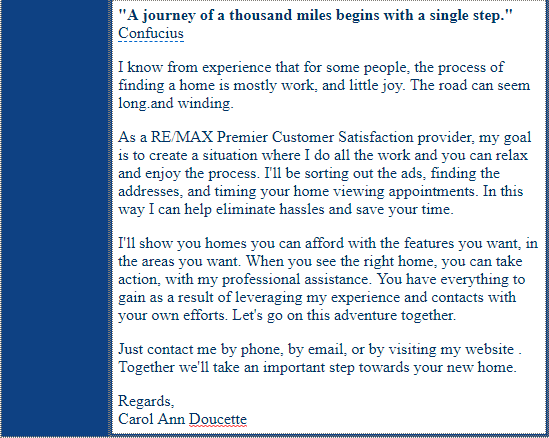 Over 110,000 agents worldwide now call RE/MAX home. RE/MAX Shoreline, with office headquarters in Portland, Maine and Portsmouth, New Hampshire, is transforming the real estate experience with the local expertise of 50 agents, the global reach of the RE/MAX brand, and proven results. Offering residential, commercial, and vacation property services throughout southern Maine and New Hampshire, RE/MAX Shoreline is poised for continued growth.